Heavy smoke made it difficult for firefighters to get inside the facility. Smoke could be seen for miles throughout the afternoon Tuesday. 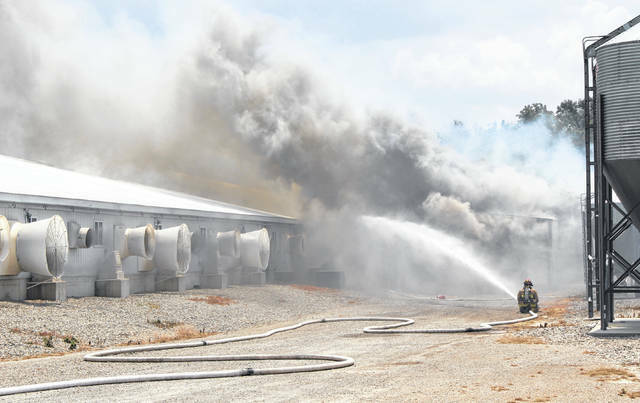 Firefighters from five counties battled a large fire Tuesday that killed 5,000 hogs at a hog facility in Fayette County. Firefighters were called in from Highland, Ross, Pickaway and Greene counties to assist in battling the massive fire. Fayette County Sheriff’s Office deputies also responded to the scene to assist firefighters in keeping control of the area. 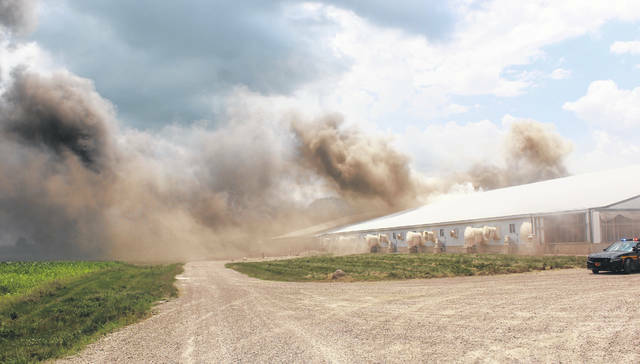 Five thousand head of swine were killed Tuesday in a fire that completely destroyed a hog farm near Good Hope in Fayette County, authorities said. 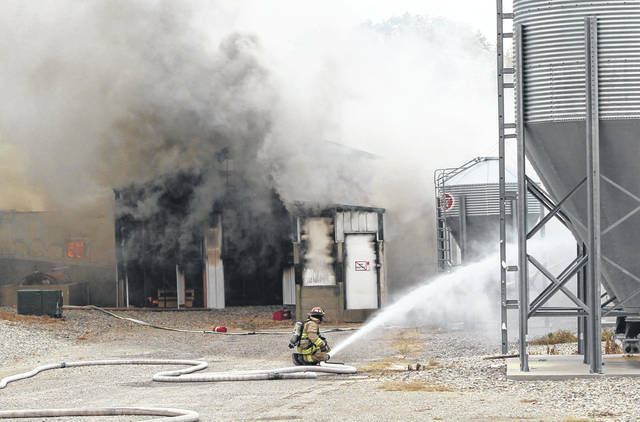 The cause of the fire, which occurred at the Straathoff Swine Farm on Old U.S. Route 35, was undetermined Tuesday evening, according to a news release from the Fayette County Sheriff’s Office. “The fire spread quickly throughout the facility causing intense heat and extremely heavy smoke, making it difficult for fire personnel to battle the interior of the fire,” the release said. One member of the fire service sustained an arm injury at the scene, according to the release. He was transported to Fayette County Memorial Hospital, treated and released. Firefighters were still trying to extinguish the fire as of 6:15 p.m. Tuesday. Most of the afternoon Tuesday, smoke billowing from the area could be seen for miles. Initially, members of the Wayne Township Fire Department were dispatched to the scene, the release said. As additional information was received that it was a working structure fire, firefighters and resources were requested from the Washington Court House Fire Department, Concord-Greene Fire Department, Bloomingburg-Paint-Marion Fire Department, Jefferson Township Fire Department and Pic-A-Fay Fire Department. As the fire continued to intensify, additional fire agencies and resources from Highland, Ross, Pickaway and Greene counties were requested to respond and assist with battling the fire and providing water tankers. The Fayette County Emergency Management Agency and Fayette County EMS also responded to the scene. Paint Creek Joint EMS/Fire District Public Information Officer Branden Jackman said the district sent a tanker and manpower to help fight the fire. Jackman said he had no further information. Agents from the Ohio State Fire Marshal’s Office were responding to the scene to investigate Tuesday, the release said. The fire was reported shortly after 1 p.m. Tuesday. 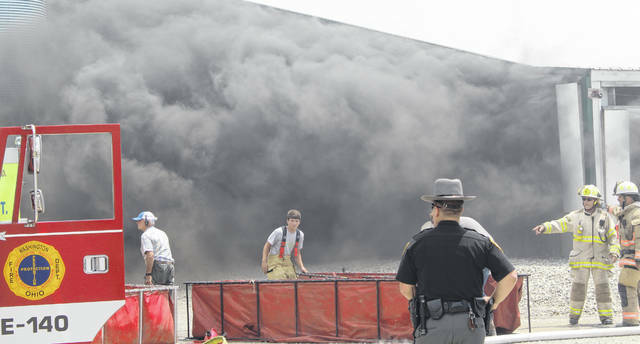 https://www.timesgazette.com/wp-content/uploads/sites/33/2018/06/web1_June-19-2018-fire-No-2-5.jpgHeavy smoke made it difficult for firefighters to get inside the facility. https://www.timesgazette.com/wp-content/uploads/sites/33/2018/06/web1_June-19-2018-fire-No-3-5.jpgSmoke could be seen for miles throughout the afternoon Tuesday. 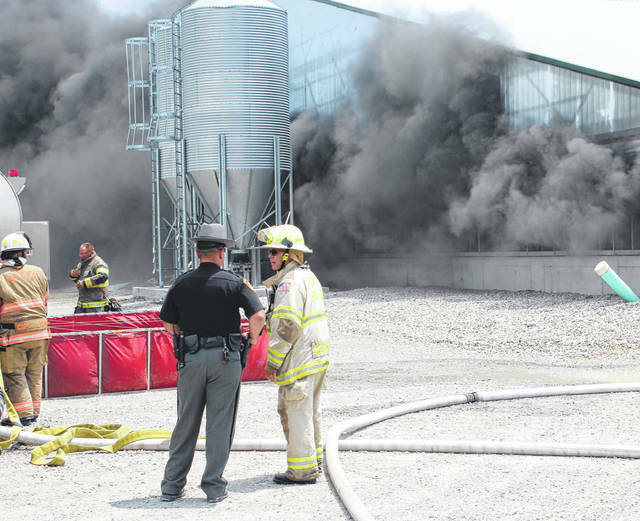 https://www.timesgazette.com/wp-content/uploads/sites/33/2018/06/web1_June-19-2018-fire-No-1-5.jpgFirefighters from five counties battled a large fire Tuesday that killed 5,000 hogs at a hog facility in Fayette County. https://www.timesgazette.com/wp-content/uploads/sites/33/2018/06/web1_June-19-2018-fire-No-4-5.jpgFirefighters were called in from Highland, Ross, Pickaway and Greene counties to assist in battling the massive fire. https://www.timesgazette.com/wp-content/uploads/sites/33/2018/06/web1_June-19-2018-fire-No-5-5.jpgFayette County Sheriff’s Office deputies also responded to the scene to assist firefighters in keeping control of the area.